Does wire color matter in electronics? I'm fairly new to electronics here. But I can't seem to find any clear answer anywhere on the internet. Are wires special depending on their color? Or they have all the same purpose with just colors to define them so people won't get confused? Say I wanted to reverse the black and red wires on a LED strip connected to a battery, would it still function properly or not? Just been curious about it lately.. The colors do not matter electrically. A wire is a wire is a wire, regardless of the color of their insulation. The color of the wire itself may matter when you get into higher voltages, but that's about the type of metal used (aluminum vs copper conductivity, for example). The colors may matter, for readability, adhering to standards, legal compliance. But that normally doesn't apply to individual projects. You can use red for ground and black for power, just be aware that someone may see it and be confused. The led strip doesn't care about the color, but it will when someone thinks well, red is positive and black is ground so let me connect it the right way and something breaks when they connect it to the power source. Wire colors are like comments in code, even for simple DIY projects. You're talking to your future self. When you take it apart in five years because it stops working, you will have forgotten everything about the original design, so it really helps to follow conventions. For industrial products it is vital to respect norms and conventions because many people may be involved in maintenance. This is also why we have silkscreen on boards, with testpoints labeled like "there should be 5V here". Say I wanted to reverse the black and red wires on a LED strip connected to a battery, would it still function properly or not? It will work fine until someone tries to troubleshoot it and says "Ha! There's your problem, the polarity is reversed!" I've seen it happen. On another forum, a guy completely destroyed a very expensive synthesizer because the wiring colors did not match the polarity, and out of all the people trying to help him, none thought about the fact that the manufacturer had actually used a lot of power supplies which had been wired the wrong way. Not for the current running though the wire but for troubleshooting, safety, and others that may encounter any project. At powerline level voltages, national regulatory bodies have mandated the 'hot' line to be certain colours such as red for power (and orange, black, or brown in multi-phase power) and green or green/yellow striped as the grounded conductor. In most low voltage DC systems I have encountered, red is positive and black is negative. It is so ingrained in our designs that people will assume it on a new system, and DIY products may only say 'connect red wire here'. When you breadboard a new design, it will not matter electrically what colours you have chosen, but it is rare for me to have completed a moderately complex build without at least one error. To troubleshoot your design is so much easier if you are consistent with what colours you have used for what part of the circuit. Colour choices can be somewhat arbitrary, but for a DC system, keep red for positive, black for ground. In other higher power systems, or RF, the wire colour or colour banding may be a manufacturing code that tells you what the internal makeup of the wire is. It could indicate insulation type (fire resistance, voltage rating) or conductor type (aluminum, copper, steel core) or other details. I worked in designing low voltage monitoring for high power systems. I was taught that red current only flows in red wires. Let me assure you that I have seen red current happily flowing in black wires until the molten copper explodes plating the room. I then kept the red current in the red wires. Always assume that wire colours means something if you are working on an existing device, even if all it means is that this blue wire is a different circuit than that violet wire. I have been a broke student and wired electronic prototypes with the one roll of red hookup wire I had. They eventually worked but I paid in time troubleshooting. My professional work used national electrical code wire colours in large gauge but the low voltage signals used a different colour combination, but the wires were physically different which also helped separate them. And in production, each product was the exact same to simplify the repair department work. So for your projects the positive and negative wires should have their own colour especially since this is where you often have to connect to external power, and then the signal(s) can have a third (or more) colour. If you have a small set of hookup wire spools, you can develop your own code particular to your projects; for example, blue for inputs, yellow for digital signals, violet for analog, and green for the output side. This will help you for years to come in troubleshooting. Remember that the colour is for your benefit and adjust your rules to your designs. If you keep the project, you can write the code down too. There are some color code conventions for low voltage (<24V) DC wiring: Red is usually the positive supply line. Black is usually ground. If there are multiple positive supplies, they will have other hot colors applied (brown, yellow, orange). Pay attention that this is totally different from AC color codes. Do not mix these two under any circumstances. 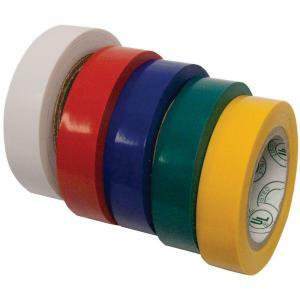 This 5-pack of electrical tape is $4. You don't have any particular obligation in homebrew electronics wiring (except to yourself, as confusing wires will waste a LOT of your time). The convention is red for positive and black for negative, particularly in a negative ground context. However in mains wiring, you have some obligatory colors. Equipment safety earthing must be green, green/yellow or bare. If an active conductor is near earth voltage, it is called neutral, and it must be white or gray in North America or Philippines, and light blue in the rest of the world (black in Au/NZ). "hot compared to earth" conductors are particular colors: much of the world brown then black then gray, North America any unreserved color (except orange for the high leg in 240V wild-leg) but convention is black then red then blue. As noted, color does not matter, but it does make life easier when assembling and/or debugging. Insulation type Does matter - for High Voltages (think tube amplifiers), direct underground, high temperature environments, durability. And then wire type depending on usage - single wires for breadboard, bundles of say 2 or 4 wires (speaker cord, lamp cord, or 4 for telephone line), twisted pair wire in othernet cable (4 pairs), shielded wire (microphone cable), bundles inside inside shielding (security system wire), twisted pair inside shielding with power & Gnd (USB cable?). Then there's wire strands (single wire, not too flexible, or multiple strands, for more flexibility) and wire gage - 30 AWG single strand for wire-wrapping, 26 AWG solid for breadboard, #2 stranded (Car battery terminals) and all kinds of stuff in between. All other colors = Hot. For a number of reasons, the most common colors typically for hot (at least in residential applications) are Black followed by Red. Anyone who works on 120V (and above) AC power should always treat any unknown wire as potentially hot, but when wiring is done properly, these standard colors help a lot to keep things straight and safe. Most people will never do more with an ATX power supply than swap one for another, and the connector only fits one way. But if you need to splice into one or are trying to build your own or do something else out of the ordinary with it, then sticking to the standard colors can make your life much easier. Yes, the wire colors matter - just imagine when agent 007 opens up the box where there are 7 seconds left on the timer, wire cutters in hand, asks "which wire do I cut, they are all the same shade of grey?" Color codes in wiring are regulated by ISO IEC 60445: 2017 "Basic and safety principles for man-machine interface, marking and identification - Identification of equipment terminals, conductor terminations and conductors". IEC 60445:2017 applies to the identification and marking of terminals of electrical equipment such as resistors, fuses, relays, contactors, transformers, rotating machines and, wherever applicable, to combinations of such equipment (e.g. assemblies), and also applies to the identification of terminations of certain designated conductors. It also provides general rules for the use of certain colours or alphanumeric notations to identify conductors with the aim of avoiding ambiguity and ensuring safe operation. These conductor colours or alphanumeric notations are intended to be applied in cables or cores, busbars, electrical equipment and installations. This basic safety publication is primarily intended for use by technical committees in the preparation of standards in accordance with the principles laid down in IEC Guide 104 and ISO/IEC Guide 51. It has the status of a basic safety publication in accordance with IEC Guide 104. This sixth edition cancels and replaces the fifth edition of IEC 60445, published in 2010. In EU - and surely in Italy, were I live - standard norms issued by ISO, EN and UNI (Italian National Standards Organization) have force of law, and whoever wants to build anything must comply with all relevant and applicable standard norms. In particular, compliancy with safety publications is strictly mandatory. Failure to comply will certainly lead to liability and prosecution in case of damages and/or injuries, not to mention death. So, the answer is, "yes, wire colors matter in electronics"
Not the answer you're looking for? Browse other questions tagged wire small-electronics or ask your own question. Does the gauge of wire make any difference when wiring the inside of an electric guitar? PMR446 interferes with small electronics?